Last major update issued on November 4, 2004 at 04:45 UTC. The geomagnetic field was quiet to active on November 3. Solar wind speed ranged between 321 and 416 km/sec. A low speed stream from coronal hole CH122 caused a minor disturbance during the latter half of the day. Solar flux measured at 20h UTC on 2.8 GHz was 135.9. The planetary A index was 10 (STAR Ap - based on the mean of three hour interval ap indices: 9.8). Three hour interval K indices: 00032334 (planetary), 11042323 (Boulder). At midnight there were 4 spotted regions on the visible solar disk. The solar flare activity level was high. A total of 14 C and 4 M class events was recorded during the day. Region 10691 rotated partly out of view at the northwest limb and remains capable of producing minor M class flares. Flares: M2.8/1F at 01:33, C1.5 at 06:44, C1.5 at 07:18, C1.5 at 07:30, C1.2 at 07:58, C1.4 at 08:40, C5.3 at 08:58, C8.4 at 09:09, C1.8 at 11:05, C2.7 at 13:48 and C3.8 at 16:56 UTC. Region 10693 decayed further in the trailing spot section while only minor decay was observed in the leading spots. The region is still fairly simple structured magnetically. 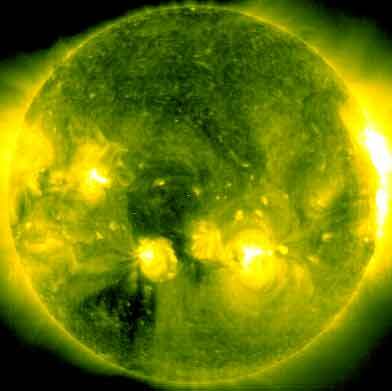 Flare: C2.1 at 09:31 UTC. Region 10695 decayed slowly with penumbra disappearing from the northernmost spot. Region 10696 developed quickly and could produce an X class flare. The region is very compact and complex with 3 magnetic delta structures within a single very large penumbra. Positive polarity spots in the northwest, north and east have merged with the penumbra which previously had only negative polarity spots. Further major flaring will increase the chance of a proton flare. Flares: long duration M1.6/1N (associated with strong type II and a moderate type IV radio sweeps and a halo CME) peaking at 03:35, major M5.0 (associated with strong type II and a moderate type IV radio sweeps and a fast, full halo CME) at 15:47 and M1.0 at 18:26 UTC. November 3: A halo CME was observed after an M1 event in region 10696 early in the day. While this CME was not aimed directly at Earth, a sideways glancing impact is possible late on November 5 or on November 6. A large, fast, full halo CME was observed after an M5 event in region 10696 during the afternoon. Again, this CME was not aimed directly at Earth. However, much more mass was observed over the west limbs compared to the event earlier in the day. This CME is likely to impact Earth's magnetosphere sometime between noon on November 5 and noon on November 6 and cause active to major storm conditions. November 2: No obviously Earth directed CMEs observed. November 1: A faint full halo CME was observed in LASCO C3 images following an M1.1 proton event in region 10691 early in the day. This CME could reach Earth on November 4. A trans equatorial coronal hole (CH122) was in a geoeffective position on October 30-31. An extension (CH123) of the northern polar coronal hole was in a geoeffective position on November 3. A recurrent coronal hole (CH124) in the southern hemisphere will rotate to a geoeffective position on November 4. Processed SOHO/EIT 284 image at 01:06 UTC on November 4. The darkest areas on the solar disk are likely coronal holes. 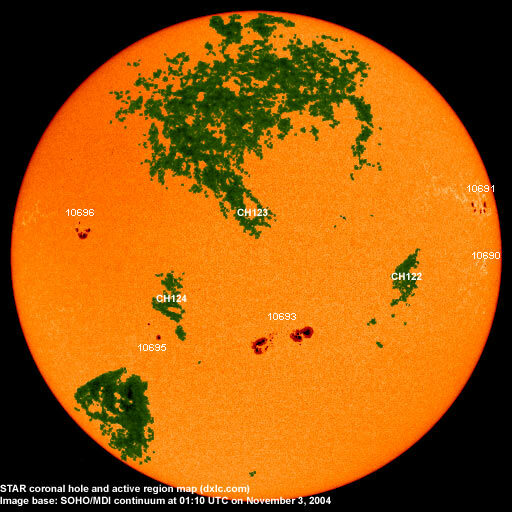 The geomagnetic field is expected to be quiet to active on November 4 due to effects from coronal hole CH122. 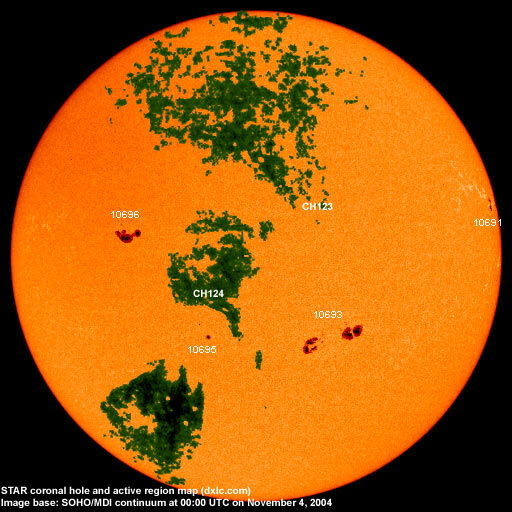 Quiet to unsettled is expected for November 5 until the arrival of CMEs observed on November 3 that day or on November 6. Active to major storm is likely on November 6. Coronal hole effects from CH123 and CH124 are possible on November 7-8. Long distance low and medium frequency (below 2 MHz) propagation along east-west paths over high and upper middle latitudes is poor to very poor. Propagation along long distance north-south paths is fair. Trans Atlantic propagation conditions are normally monitored every night on 1470 kHz. Dominant stations tonight: Radio Vibración (Venezuela) and Radio Cristal del Uruguay. Radio Belgrano (Argentina) was noted on 1510 kHz. From North America only a few weak signals could be heard at 04h UTC: CJYQ 930, WEEI 850 and WWZN 1510.